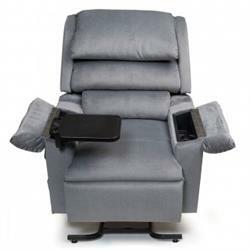 The 3-position full recline puts you in a position ideal for napping or relaxing. 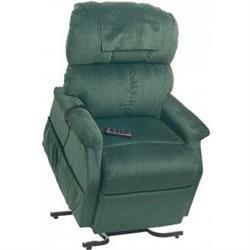 A 3 position lift chair (often referred to as a 3 way recliner) allows the user to recline comfortably into a sleeping position, a “TV recline” position, and a standard straight position. Its back and ottoman operate in tandem (i.e. the backrest reclines as the footrest raises) and both are controlled by a handheld remote - perfect for people of medium to large build. If you enjoy the support that a recliner provides, but find it difficult or impossible to sit down or stand up without assistance, 3 position lift chairs are an ideal option. 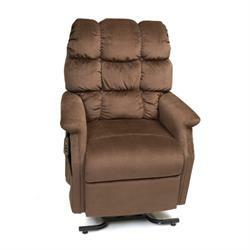 The Monarch is a distinctive lift/recliner that combines a generously stuffed seam back with a soft supportive seat. Its three-way recline system allows you to get into our “full napper” position for deep comfort. 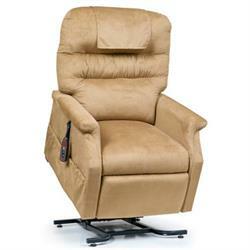 The Regal has a three pillow waterfall back for deep lumbar support and comfort. Each pillow has a zippered closure on the underside to allow for customization of the back density by simply adding or removing the Dacron filler.